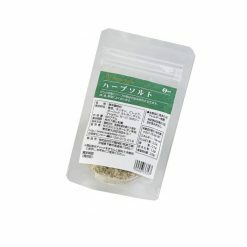 The natural flavors of pink rock salt and herbs can be used to enhance umami when cooking. The Bolivian rock salt in this new item is finer than previously, allowing it to dissolve more readily when added to dressings and other foods and making it easier to use. Our herb salt is made using a good quantity of quite a few herbs and spices; when used in cooking it will make any dish exceptionally fragrant. It is perfect for when you’re short on time, but want to make sure the dish you’re cooking has that little extra something. The salt in our herb salt was chosen with great care. The taste of rock salt from Bolivia, mined from the Andes, will draw out the umami of your ingredients and serve to enhance the flavors of your cooking. The pink rock salt in this herb salt developed over the course of 300,005,000 long years, from ocean water that became enclosed in the earth of the Andes due to changes in the Earth’s crust. Because the crystals of this buried rock salt are mined without being dissolved, it is quite mild; with an appealing depth of flavor. 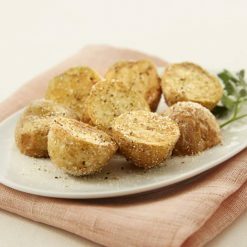 Recommended uses:Herb panko: Mix panko (flaky bread crumbs) with our herb salt, smear onto chicken meat or white-fleshed fish, and cook in olive oil.Dressing: For an easy dressing, combine our herb salt with olive oil and vinegar (and a touch of lemon juice to taste). 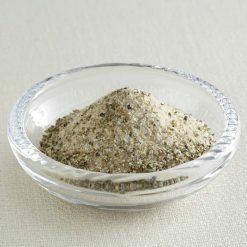 This mixture can be added to salads, or rubbed onto bread for a quick, classy appetizer.Our herb salt is particularly well-suited for seasoning dishes such as seafood marinade, herb roasted pork, beef stew, and meat confit; but is also perfect for adding a subtle bloom of flavor to a wide range of savory foods. This product contains able salt, onion, pepper, garlic, oregano, thyme, marjoram, sage, celery..